We understand that you're concerned about your family's heath and that's why we offer absolutely safe cleaning service, which do not use toxic products and harmful chemicals. If you have children, pets, or both or if you're suffering from allergies, our home cleaning Runnymede is the safest way to obtain a healthy and neat environment. Look at our customer testimonials to learn what residents think about our effective eco-friendly cleaning methods. The web server used by Cleanersrunnymede.co.uk is run by Dedicated Server Hosting and located in Great Britain. This web server runs a few other websites, mostly in the english language. 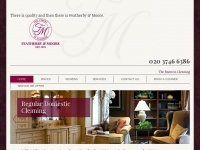 The websites of Cleanersrunnymede.co.uk are served by a Nginx server. The content management system WordPress is used. The HTML pages were created with the latest standard HTML 5. The website does not specify details about the inclusion of its content in search engines. For this reason the content will be included by search engines.